CTA rail service was cut 10 percent in 2010, but has slowly rebounded since. Ridership has increased nearly 20 percent since 2008. Data from CTA, compiled by Metropolitan Planning Council. The Chicago Transit Authority expects that more people will ride the ‘L’ next year, especially in north side neighborhoods. To accommodate this increased demand, it added six new rush-hour trips on the Brown, Red, and Purple lines at the end of September, and will add even more frequency to the Brown Line and Orange Line this weekend. Additionally, its 2015 budget will add two more rush hour trains to both the Blue and Orange Lines. CTA projects that this year’s rail ridership will be 2.5 percent greater than last year, and they predict rail ridership will grow another 1.1 percent from 2014 to 2015 — adding up to a 20 percent increase since 2008, despite the steep recession. The CTA expects ridership to continue growing as Illinois’ unemployment rate continues to fall, and the cost of parking downtown continues to rise. CTA will add a lot of new service to the Brown Line starting on Sunday. The CTA will add five more evening trains on weekdays. On Sundays, service patterns will now nearly match weekdays and Saturdays. Instead of running the Brown Line as a shuttle between Belmont and Kimball, trains will go all the way to the Loop on Sundays starting at 5 a.m. (instead of 6:30 a.m.) until 1 a.m. (instead of 11:50 p.m.). This eliminates the transfer at Belmont, resulting in a one-seat ride for Albany Park residents going to and from the Loop. Now, the only times when the Brown Line will operate as a Belmont shuttle is between 1-2 a.m. from Tuesday through Sunday (i.e., the weekday and Saturday schedules). The new all-Loop Sunday service on the Brown Line means that stations in River North, Lincoln Park, and Lakeview – including Merchandise Mart, Chicago, Armitage, and Wellington – will open earlier and close later on Sundays. Substantial population growth on the Near North Side may be contributing to weekend ridership growth. These additional Brown Line trains will benefit in the coming years from construction to repair the Ravenswood Connector slow zones between Armitage and the Merchandise Mart. CTA started working on the structure last year, and moved into track work this year. Not all expanded service is going to the north side. The CTA will add 12 more runs on the Orange Line on Saturdays, responding to a five-year trend of increasing ridership. Saturday ridership has increased 22 percent since 2009, said CTA spokesperson Tammy Chase, and just this year (January to August) is up five percent over last year. The new Saturday service should reduce crowded rider conditions on what Chase called the most packed off-peak trains in the network, with standing-room-only conditions throughout the day. Systemwide rail service, measured by the number of trains and hours running each day, was cut 10.2 percent in 2010, and dropped further in 2011. 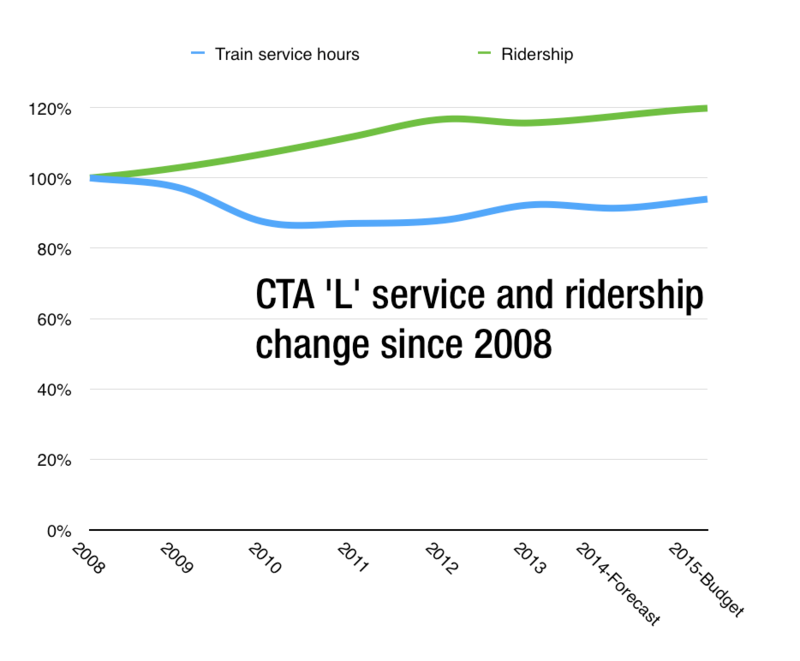 Since then, CTA added some service back in 2012 and 2013, but hasn’t yet restored 2009 levels of service. The Orange Line’s popularity is growing in spite of incompatible land uses and unwalkable stations along the line. Increasing ridership could be a result of the southwest side’s growing population and larger households. 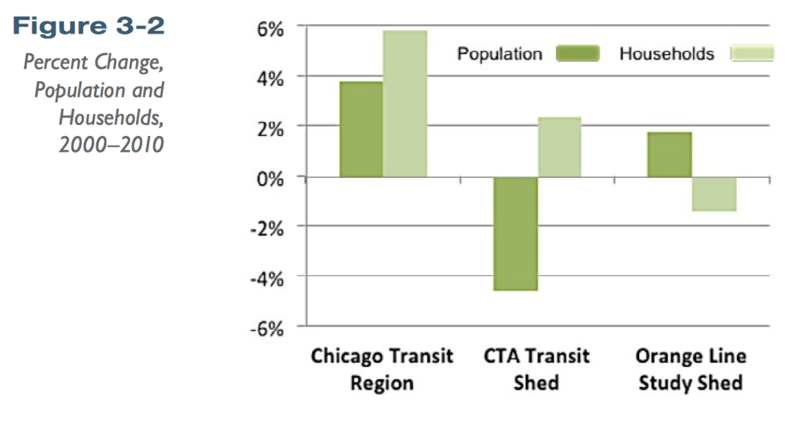 The population in areas around the Orange Line grew between 2000 and 2010 [PDF], even while dropping considerably across the CTA transit shed as a whole. Happy to hear about the additional trips on the Purple Line. That transfer at Howard can take forever, and the trains are always crowded during rush hour. Do they do this same study with buses? The 72 North Ave bus is horrendously crowded – standing room, shoulder to shoulder with three other people starting at 6am. A limited run be tween the West side barn and the Blue line would help. Many (most?) people exit at either Western and Damen, so a dedicated bus can alleviate the overcrowding during rush hours. Anecdotal: I have been passed by several busses even as early as 6am. Buses filled to capacity at SIX AM! I know that eastbound passenger density drops after the blueline connection at Damen, so this would target the need rather than swamp the entire route with additional buses. I can’t afford to miss multiple buses that early. No one else can either. No one deserves the meat packing/sardine experience of the North Avenue bus or getting passed up because of overcrowding at or before rush hour (as in my case). Eliminating crowds is impossible; but an inch or two of space and the assurance that no one will be passed up by a bus is possible through proper planning. Awesome… So the CTA (a stupidly underfunded agency), is JUST NOW getting CLOSE to restoring service to the levels seen SIX YEARS ago, even though ridership numbers are UP 20 PERCENT in that same period… How are people not screaming at our politicians about this??? We deserve better for a city this size. Yes, CTA analyzes bus ridership in the same way, but their response is slightly different. One issue: rail service sees none of the disadvantages that buses have in mixed traffic, like car traffic congestion, constantly stopping at stop lights, breakdowns, etc. I will have an article soon. I agree that the CTA is stupidly underfunded. It’s not the CTA’s fault that they are always having to do more with less. Their choices are most often to raise fares or cut service (or reduce service on some parts of the system and use those savings to increase service on other parts of the system, which they did in January 2013). The other annoyance is that on some parts of some routes, the headways rise SHARPLY (from, say, 8min to 25min) right about at 6PM. At which point there is still another hour of rush hour traffic to deal with, and lots of people not even off work yet. Which part of which expressway should we expand next? We have to spend the money on something, ya know – use it or lose it, right? Due to a government/bureaucratic law, both CTA and CPS (Chicago Public Schools) are supposed to break even or be in the black. Imagine trying to run an expansive transit agency serving one of the largest populations over a huge area operating 75% of every day, on a budget that you have to lobby for every year, that gets cut almost indiscriminately for other state, county and city projects. All while offering one of the lowest fare-ladders in the nation. I’m living in San Francisco right now, a city 1/6th the size, with about a 1/4 of the population, where transit costs are three, four and five times as much to go the same distance. Be grateful, people, or get a bike. It could help level the playing field and stop recent transit ridership bleeding.